Sam is a kid that thrives under responsibility, so I've decided to give him some. 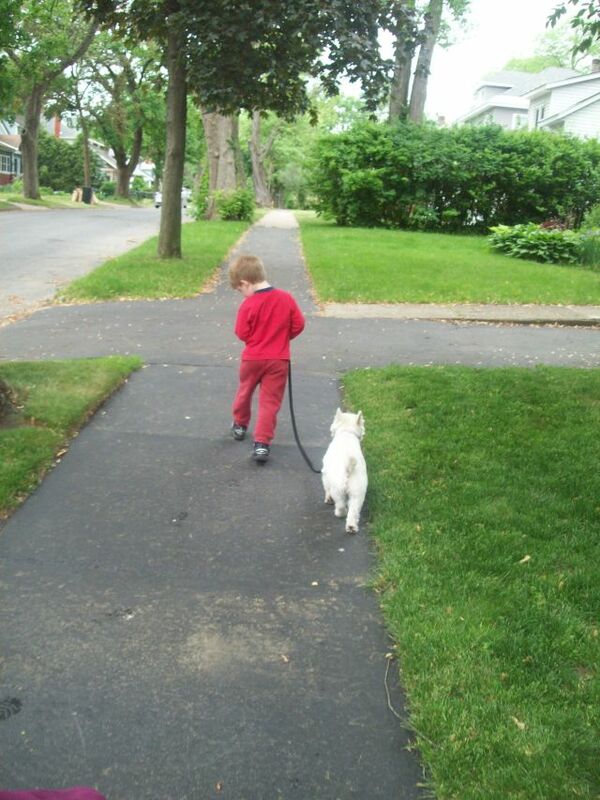 Every day now, we go for a walk around the block and Sam is responsible for walking Tuendi. While we're walking, I tell him about dogs--how to watch their body language, how to talk to them, the proper way to approach and pet them, and how to give them treats. Tuendi is not exactly thrilled that I'm asking her to follow Sam's commands, so Sam is getting a crash course in Resistant-Stubborn-Puppy 101. She'll dig in her heels and refuse to walk, so Sam is learning the importance of the high, enthusiastic voice and the well-timed back scratch. He's also learning that respect between humans and dogs is a two-way street, and that in order to get Tuendi to work with him, he's going to have to calm down and be in control. I see it as one more way for him to practice the lessons we're trying to teach him. It's amazing how well he's doing in just a week. Now he's gentle with the cats and calm around the dog. Tuendi's happier than ever (and that's saying something because she's always happy). Sam's making substantial progress and I'm so proud of him. it has been great for for capt. comic, too, now that he is responsible for walking lucy. that's great that you have a goal he wants so easily available to help him learn to recognize his extremes and come out of them.